Holton coach Brooks Barta labels his offense a “mixed bag.” On one side, the Wildcats’ traditional wishbone, run-heavy scheme has delivered 340 rushing yards and 385 total yards a contest. Through four games last year versus the same schedule, Holton had 328 rushing yards and 349 total yards a contest. However, the point totals are much different. Holton (2-2) is inefficient offensively compared to 2014 with just 20.8 points per contest. The Wildcats (3-1) averaged 40.4 points per game last fall. The Wildcats have had some injury problems along the offensive line and unusually made a lot of mistakes. The Wildcats have faced a difficult schedule with a 23-22 overtime loss to Silver Lake when Holton held a sizable edge in total yards. In Week 2, Holton fell 20-13 to Class 5A power Maize South. Holton defeated Sabetha, 14-13, before a 34-6 win versus Hiawatha last week. This Friday, Holton, ranked No. 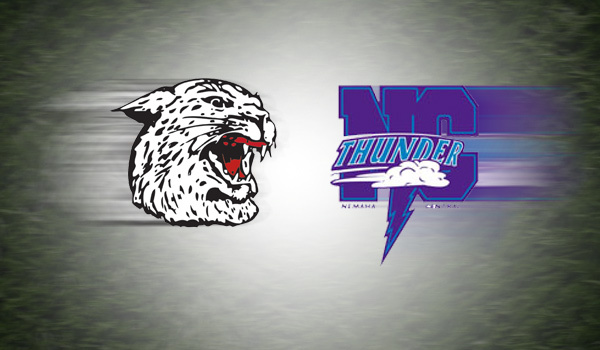 3 in 4A-II, plays host to statistically one of 3A’s dominant teams, Nemaha Central. The Thunder (4-0) have outscored teams 196-20 and rank No. 3 in the 64-team classification in scoring offense and scoring defense. That includes a 31-8 win versus Sabetha and a 72-0 victory versus Hiawatha. Holton has won seven consecutive Big Seven titles and has 48 straight league victories. “Sabetha has got a good team,” coach Warren Seitz said. “The last two or three weeks, we have continued to play well, and so we are happy with our progress up until this point. Up front, we have got some pretty good linemen, and I think in high school football, if you have got a good line, that can take you a long ways. Nemaha Central is in his second year of a consolidation between Nemaha Valley and Baileyville B&B. Last year, the program went 7-3. Seitz said the change was a “smooth transition” in 2014 and several former B&B players start on both sides. The Falcons added 12-15 players to Nemaha Central and increased the squad’s quality and depth. “It’s really worked out well for us,” Seitz said. Senior fullback/linebacker Neil Sudbeck, senior wide receiver/safety Dylan Steinlage, senior lineman Kyle Kramer and junior quarterback/defensive back Ryan Hasenkamp are former B&B players and returning starters. Hasenkamp stepped in the last three games of ’14, played well and has continued his ability this fall in the spread offense. Seitz was at Topeka West in 2004-05 and had a multi-dimensional quarterback with Ryan Kelly, an eventual record setter at Benedictine. Since then, Seitz has always tried to have a dual threat under center. On the line, senior captains Winston Meyer and Kurtis Niehues have played well. Meanwhile, Holton graduated four of its top five rushers from 2014, including Indie Allen (1,350 rushing, 11.5 yards per carry, 14 TDs). Senior Justin Rieschick moved to quarterback after he collected 444 yards as a junior, third-most on the squad. Rieschick paces the Wildcats with 308 yards, one of five rushers with at least 230 yards. The five different backs have between 41 and 48 carries for the Wildcats. Barta has traditionally used multiple rushers, but said “that’s contributed to our mistakes” this year. All the running backs are speedy and not very big; Barta said his backfield is normally bigger than this fall. Only senior Mason Barta (6-foot-2, 205) is bigger than 170. Holton has lost several starters on the line. Senior Torin Kaboudan (health) wasn’t able to play this season. Junior Brandon Lenherr looks to return in two to three weeks. Senior Jacob Coufal started some in 2014 and is also expected to miss several more weeks.